Do you ever wish you could just get a grip on that cold that seems to strike you around the same time every year? Do you envy your friend’s ironclad immune system because yours seems to desert you when you need its protection most? While you have at some time or another felt like a helpless victim WHO HAS fallen prey to the “bug” going around, you actually have much more control over its impact than you realize! Dr. Steve’s Immune System Booster Hypnosis MP3 can help you! Researchers here have determined that hypnosis and related relaxation techniques can actually prevent the weakening of the immune response that often follows periods of acute stress. A new study suggests that hypnosis may even slightly enhance the immune status in some people compared to similar individuals who don’t use these interventions. If true, the findings could have important health implications for patients facing surgeries. Students who hadn’t used self-hypnosis prior to academic tests showed a major difference in the levels of two assays used to measure the activity of white blood cells important to immunity. The research, reported in the Journal of Consulting and Clinical Psychology, is the latest to test whether people can protect themselves from immune system changes that normally accompany increased stress using Immune system hypnosis..
Lead author Janice Kiecolt-Glaser describes using hypnosis in this research as something like “hitting a reset button” for the participants in the study. “We’re really talking about being able to shut out a lot of distracting thoughts. And it varies according to how anxious a person is at the time,” said Kiecolt-Glaser, a professor of psychology and psychiatry at Ohio State University. This group of researchers has done numerous studies in the last decade using these students as subjects since the exams they face are known to be highly stressful events. At the end of this project, students who had not used self-hypnosis as a relaxation technique prior to their academic tests showed a 26 to 39 percent difference in the levels of two immunological assays utilized to measure the activity of certain white blood cells — T-Lymphocytes – important to the immune response. This approach uses two compounds prepared from plants called Con-A and PHA. Measuring the activity of these cells serves as a measure of a healthy immune response. Glaser said these two plant compounds are used by researchers as “surrogates” to gauge how readily certain white blood cells – T-lymphocytes – multiply in one of the most important stages of an immune response. Earlier studies had looked at whether immune status could be improved by the use of hypnosis. This group wanted to determine if the frequency of the technique – how often they practiced it – and the hypnotic susceptibility of the individuals tested played a role in their immune status at test time. Thirty-three medical and dental students at Ohio State were selected for the study. All had completed two tests to determine how susceptible they were to hypnosis. Half of them were taught to use self-hypnosis as a relaxation technique while the remaining students served as a control group. Students in the hypnosis group were required to attend a minimal number of sessions and advised to practice self-hypnosis regularly. Initial blood samples were taken from all students to determine a baseline of immune status markers prior to the start of the study. A second set was taken three days before the exams. • The more frequently the students in the hypnosis group practiced their technique, the better their immune response was, based on these tests. The researchers said that for patients, the study shows hypnosis – or other intervention techniques – is only useful when patients practice it. “If you have no compliance, then there is no real intervention,” Marucha said. Kiecolt-Glaser said that intervention techniques can have a real practical value to patients facing surgery, since anxiety about a coming test is no different than anxiety over impending surgery. If the immune response can be maintained – if not enhanced – then recovery from the surgery should be less problematic. “Patients should do these techniques and do them consistently,” she said. The Fetzer Institute supported this research. This Immune System Booster Hypnosis MP3 gently guides you into a relaxed state of trance enabling mind and body to accept hypnotic suggestions to boost and strengthen the immune system to combat immune depleting conditions. Hypnotic suggestions are provided with words and images that communicate strength and power to your immune system. The Immune System Booster Hypnosis suggestions are intended to empower your body’s system of protection and defense from uninvited guests. This Hypnotherapy mp3 program also includes hypnotic suggestions for a balanced immune system that can recognize which cells belong and which do not belong within you. Buy this Hypnosis mp3 to boost your immune system today! The mind/body connection has long been understood by hypnotherapists. In fact, the mind has such a powerful impact over physical well being that people have been known to “will” themselves into better health or even to death. Hypnosis works to keep the body healthy by boosting the immune system through positive thought processes that reduce stress and ignite the body’s own healing abilities. Emotional stress has such a destructive impact on health. When stress is left unchecked, it causes the body to have a continual release of the hormone cortisol which can negatively impact such things as blood pressure and cholesterol. This can ultimately lead to heart disease. Hypnosis works to relax the mind and body to reduce stress and cortisol production. In addition, hypnosis can boost the immune system by acting as a catalyst to wound healing and vitamin absorption as it eliminates stress. A study of 33 medical students was conducted by the Ohio State University and reports that self-hypnosis was able to reduce stress and lead to strengthened immune systems in the sub-group given the hypnotic relaxation training. These students experienced less anxiety during exam time. In addition, blood tests indicated greater immune responses as T-cells in their blood were studied both before stressful periods and during them. Hypnosis is used at a time of day when the participant is able to completely relax, usually just before going to sleep. Self-hypnosis will not be effective if there are other distractions such as driving a car or doing tasks around the house. The mind needs to relax to the point where the hypnotic messages can completely penetrate the subconscious. This way the stress that can hinder the immune system can be removed and the body can become strengthened. 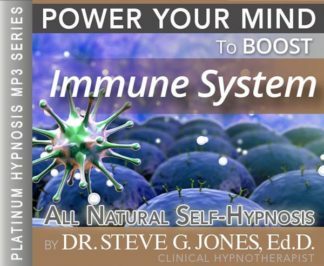 Clinical Hypnotherapist, Steve G. Jones’ Immune System Booster Hypnosis MP3 session is used over the course of a few weeks to reduce stress and improve immune system function. Steve G. Jones, Ed.D., Clinical Hypnotherapist, charges $1,500 for a custom recording and $25,000 for a one-hour private hypnotherapy session at his office. But you can get all the benefits for this low price. Simply listen to the Immune System Booster Hypnosis MP3 download every night as you go to bed for three weeks and feel the changes happening in your life. You will feel more empowered, more in touch with your true self, and you will truly know that your goals are within your reach. Even though we are not as likely to get sick during the spring and summer months, it’s important to keep your immune system strong. Our immune system helps fight off diseases, toxins, bacteria, and viruses, not just illnesses like a cold and the flu. Your body’s immune system is it’s defense system and it is very important to keep your body healthy and strong. There are many things you can do to boost your immune system. A simply thing that will greatly boost your immune system is taking a multi-vitamin every day. It gives your body the nutrients it needs to fight off disease and keep itself strong. Another way you can boost your immune system is by eating healthy. Eating plenty of fruits and vegetables and lean proteins will keep you healthy and make you feel more energized. I encourage you to think of various ways in which you could give your immune system an extra boost. Perhaps you will exercise a little more to build a stronger body to fend off disease. Drinking more water will also help your body. And perhaps beginning to remember that inner central core of existence that plays deep within the central part of mind and body, that place of inner harmony and inner calm, quiet stillness, a place of inner healing powers and light force and remembering that from the very beginnings of existence the body and mind have known how to heal themselves. The body knows how to heal over scrapes and wounds and injuries, how to generate new cells and new tissue whenever needed. And the body knows equally well how to regulate its own healthy functioning, regulating heart rate and breathing and body temperature and blood pressure, all effortlessly, unconsciously, automatically maintained at healthy levels And the body knowing how to maintain it’s own healthy blood chemistry, maintaining the necessary hormonal and chemical components for a healthy and functioning mind and body. Maintaining and regulating the serotonin levels, the potassium, the endorphins and all necessary hormonal and chemical components that allow for an active and alert mind and body, but without over excitation or over stimulation and in similar fashion the body maintaining an immune system effortlessly, automatically warding off invading organisms before they have the chance to gain a foothold. Building resistance, maintaining resistance, building antibodies, the white blood cells surrounding the invading viruses or bacteria like white knights on white chargers and the body knows how to regulate its metabolic system. The metabolism being designed to help up stabilize our bodies at a normal, moderate, healthy level. And in every way mind and body working for health. Healing, maintaining, healing, maintaining. Maintaining healthy functioning and somehow knowing of these inner resources the strength, the growth, the healing, the life force, making everything easier. Your immune system is a very important part of your well-being. It is hard to be happy and purchaseive when you are sick. With hypnosis, you can improve your body’s natural defense system. This hypnotherapy session targets all aspects of your immune system to help your body fight off illness. This is a great recording to listen to when you are sick or when you want to prevent getting sick. It often seems that viruses such as the cold and flu, hit with no warning, making you feel terrible and helpless. Along with rest and drinking a lot of water, this self-hypnosis recording will help your body fight off the virus. Does it seem like every time you are around someone who is sick, you seem to catch their sickness? The Immune System Booster program will help you do just that…give your immune system a boost so that you do not get sick. Realize that hypnosis gives you control over your mind, body, and spirit. You can and will improve your immune system with this powerful program.